On October 27, various news outlets reported that the singer will be reprising his role as “L” in the revival production of the musical “Death Note,” which is set to open next January. 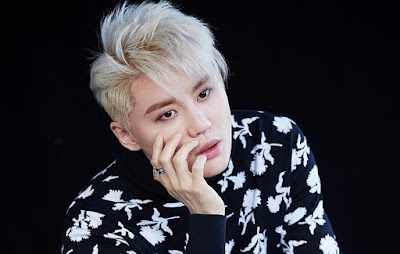 Following the end of its run, Kim Junsu will reportedly be enlisting sometime in the first half of 2017 in order to fulfill his mandatory military service. A source from his agency C-JeS Entertainment confirms that “Death Note” will be the singer’s last production before his enlistment, but clarifies that the exact date of when he will go has not yet been finalized. Kim Junsu is currently finishing out his run as Dorian Gray in the musical of the same name, and will soon begin full-blown preparations for both his end-of-the-year concert as well as the upcoming “Death Note” musical once “Dorian Gray” closes with its last performance on October 29. Meanwhile, fellow JYJ member Kim Jaejoong is set to be discharged after finishing up his service in December of this year. [INFO] 161027 #Junsu will enlist into South Gyeonggi Police Promotional Team in early-2017, exact date has not been set.